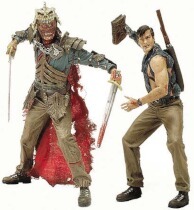 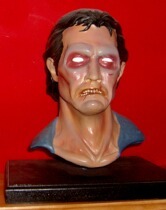 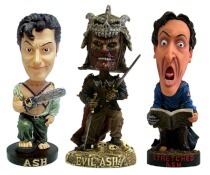 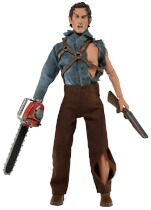 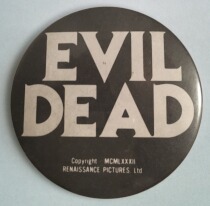 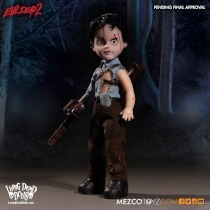 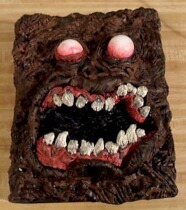 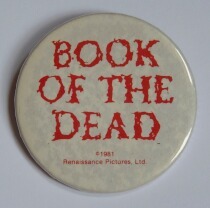 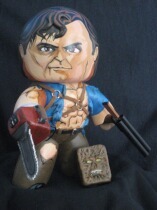 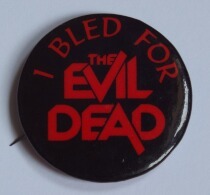 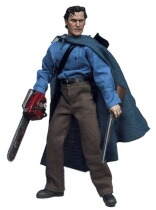 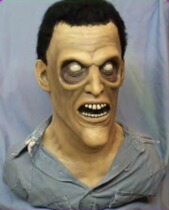 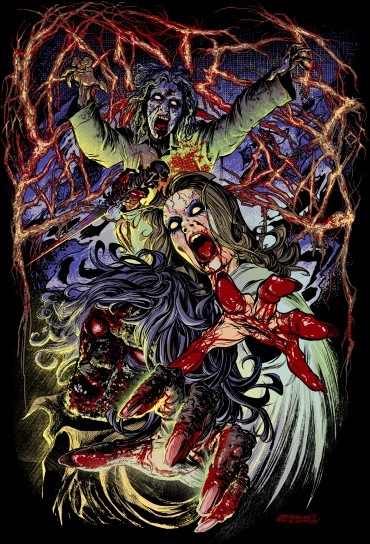 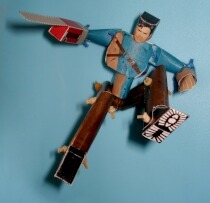 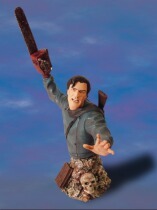 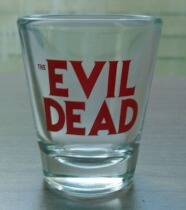 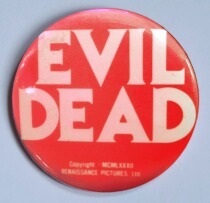 This page aims to be the ultimate comprehensive reference list of all the the official and unofficial merchandise available in the past or present for the The Evil Dead, Evil Dead II, Army Of Darkness, and anything else suitably related to the trilogy. 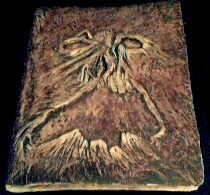 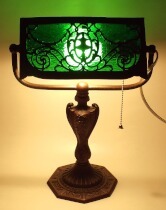 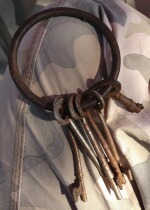 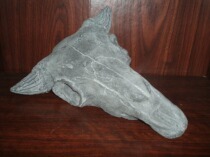 The material listed, ranges from mass produced items down to one-off fan made items, and everything in between. 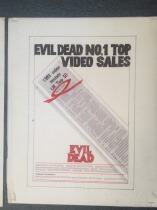 All the items have been allocated into one of thirteen simple general categories which are; 'DVD', 'VHS', 'Other Media', 'Books', 'Magazines', 'Comics', 'Games', 'OST', 'Toys', 'Sculpted Pieces', 'Props & Replicas', 'Clothing', and 'Advertising', with a fourteenth 'Misc Items' section for everything that doesn't fit elsewhere. 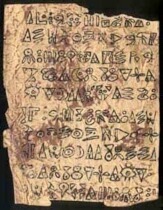 Each section has a short piece of explanitory introductory text, along with any applicable notes. 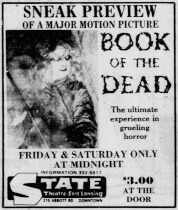 Rather than spilt the items down in to sub-page after sub-page, we've decided to have everything together on one huge list, so it might take a minute or so to to load as there are nearly 800 individual items listed. 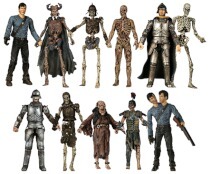 As a long term goal, we may expand this main collectables page to include 'More Details' sub-pages linked from this main list, with more photos, specs & information about each item. 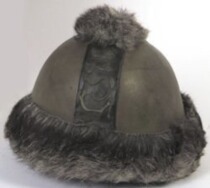 Where known & applicable, we have included details such as manufacturer & distributor names, release dates & catalogue numbers for each item. 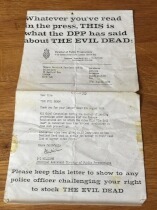 If your able to help us out on any information we're still missing, please let us know. 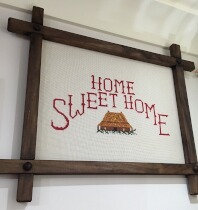 We have also tried to include a creator's name or username along with each fanmade item, but if you see something which you have made and want to add your name or make a correction, please contact us. 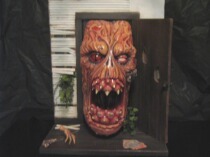 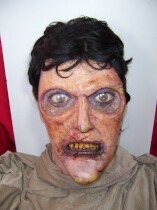 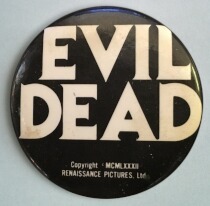 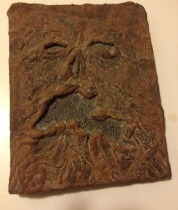 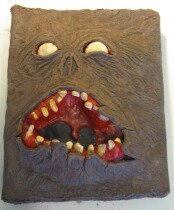 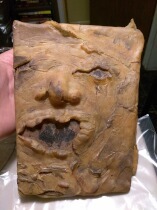 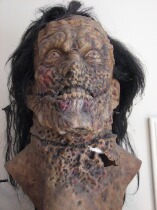 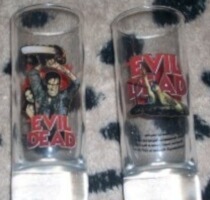 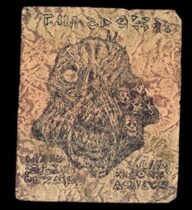 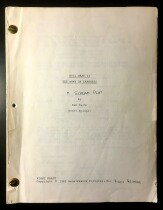 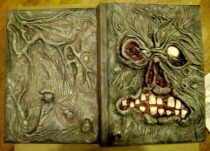 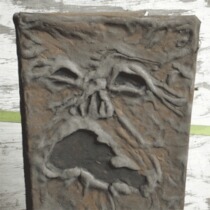 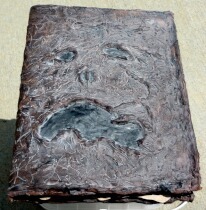 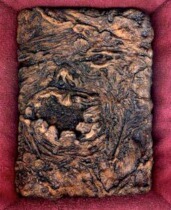 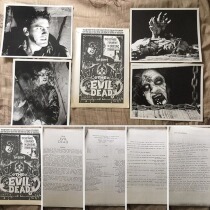 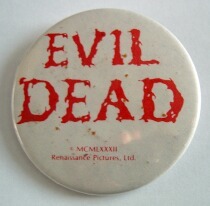 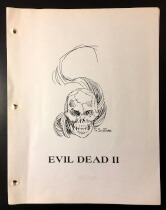 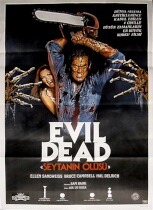 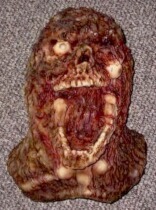 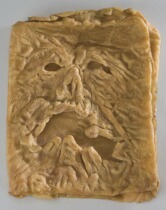 You can view collection photos sent in from Evil Dead fans around the world via the below link, as well as the physical collection of items owned by the webmaster of this site, and finally a page detailing my personal collection of Evil Dead Trilogy related video material. 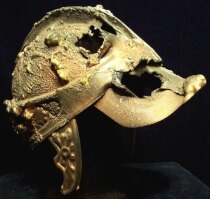 Because of the vast array of official and unofficial items which have been made over the years, knowing about & cataloguing every single past present & future item ever produced is virtually impossible, and this section can never really be certified 100% complete. 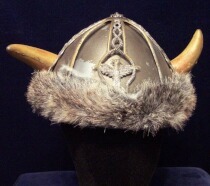 It will simply remain 'in progress' for the foreseeable future, with periodic updates of new items from time to time. 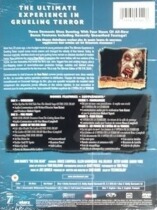 If you have anything we don't, please get in contact and let us know so we can add it to this list. 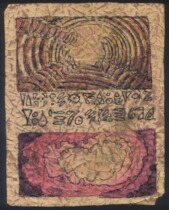 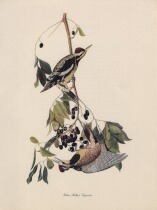 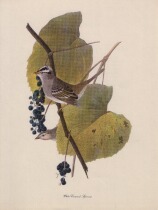 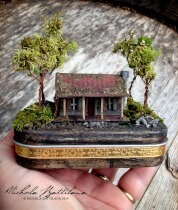 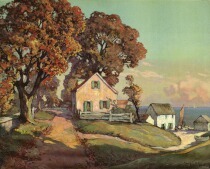 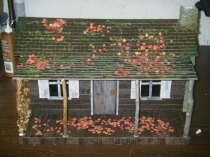 Clicking any of the below images will display a larger version in a 'Lightbox' window. 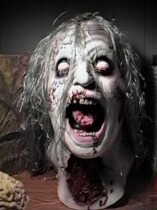 Use the arrow icons or your keyboard's left/right arrows to navigate to the next photos. 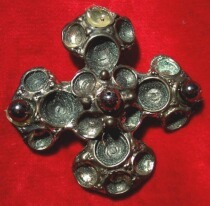 You can also middle-click an image to open the larger version in a new window. 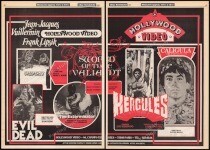 If you want a full-resolution version of any of these images, or more information on anything featured, then please ask. 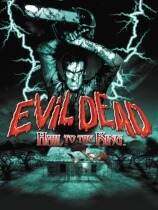 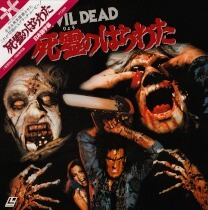 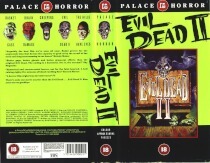 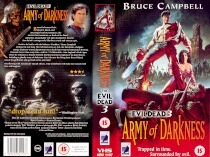 This section covers every version of The Evil Dead, Evil Dead II & Army Of Darkness, and compilations & variants thereof, available on standard DVD worldwide. 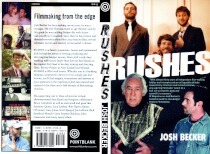 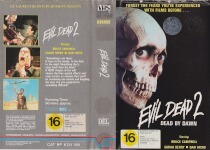 All other media formats can be found in the sections below. 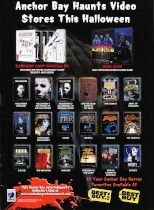 One point worth noting; while all the German DVDs listed below can be bought online and in applicable stores, some of them may be unofficial or bootleg releases. 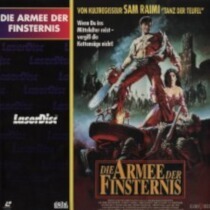 There are a handful of German distributors notorious for releasing professional quality bootlegs of films they haven't actually licensed. 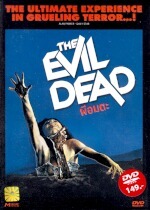 This especially applies to the R2 German Evil Dead trilogy 12 DVD box set, which we've included here solely because of it's content. 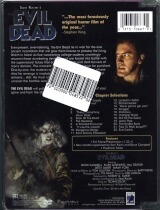 The DVDs are listed alphabetically by country of release. 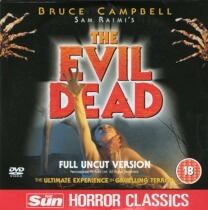 This section covers every version of The Evil Dead, Evil Dead II & Army Of Darkness, and compilations & variants thereof, available on standard Blu-Ray worldwide. 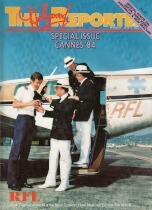 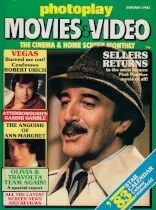 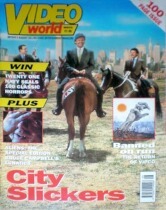 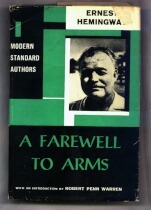 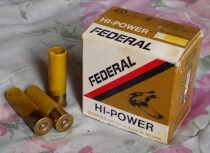 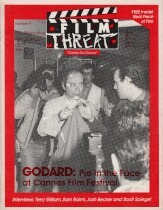 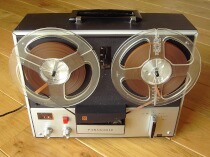 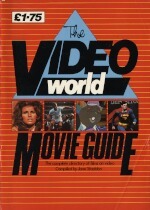 Other media formats can be found in the sections above and below. 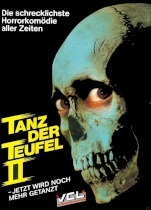 One point worth noting; while all the German Blu-Rays listed below can be bought online and in applicable stores, some of them may be unofficial or bootleg releases. 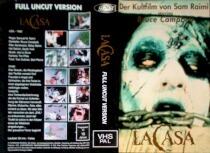 There are a handful of German distributors notorious for releasing professional quality bootlegs of films they haven't actually licensed. 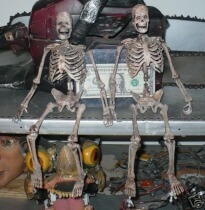 This new section is still under construction so it's still a little sparse. 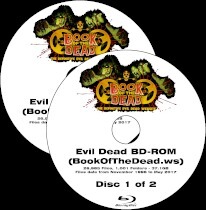 The Blu-Rays are listed alphabetically by country of release. 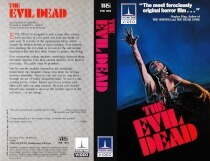 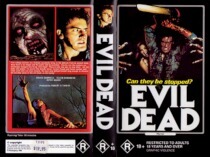 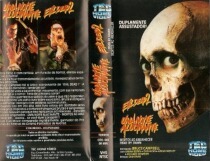 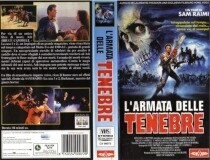 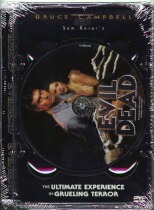 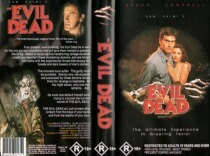 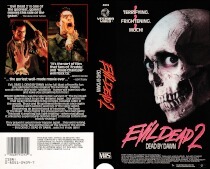 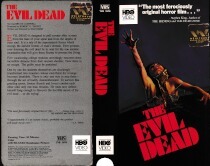 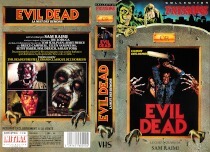 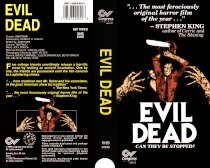 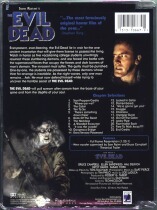 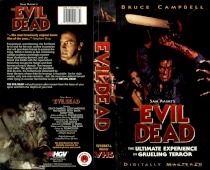 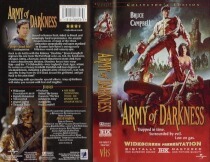 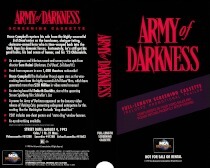 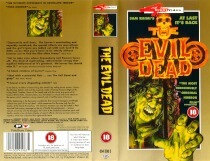 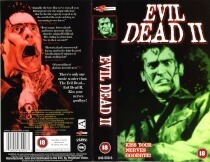 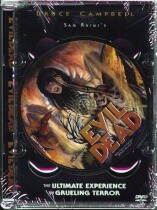 This section covers every version of The Evil Dead, Evil Dead II & Army Of Darkness, and compilations & variants thereof, available on VHS tape worldwide. 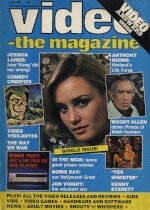 any other remaining media formats not covered here can be found in the section below. 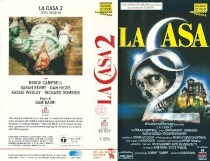 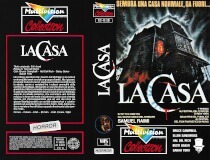 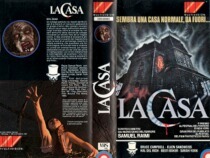 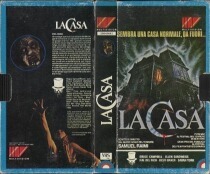 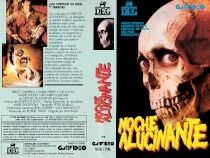 The tapes are listed alphabetically by country of release. 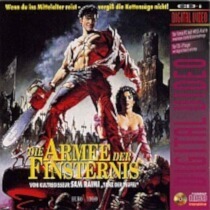 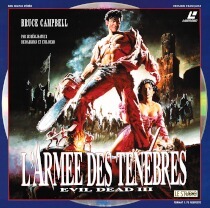 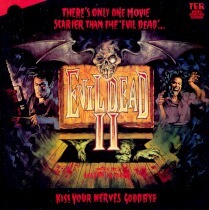 This section covers every version of The Evil Dead, Evil Dead II & Army Of Darkness, and compilations & variants thereof, available worldwide on any format. 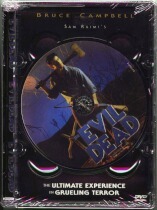 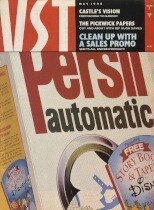 Currently this includes Laserdisc, Betamax, VHD and VCD (standard DVDs & VHS can be found above). 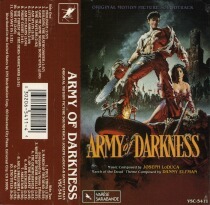 The titles are listed alphabetically by country of release. 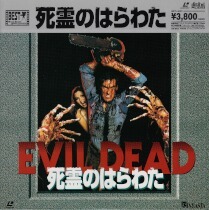 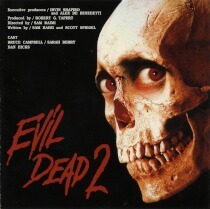 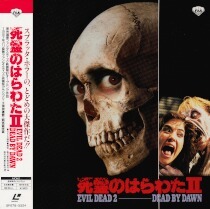 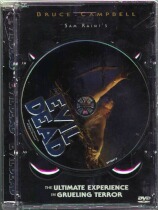 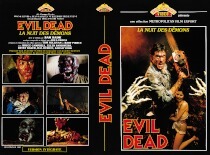 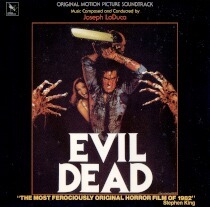 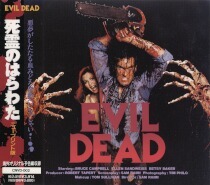 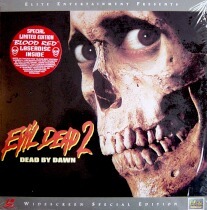 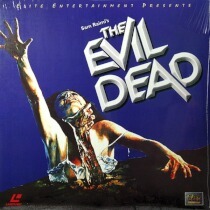 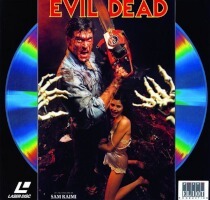 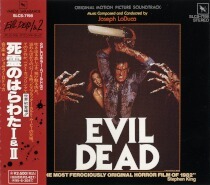 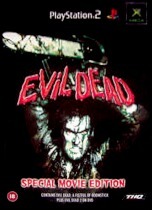 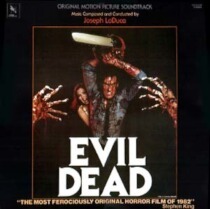 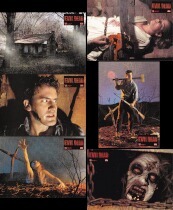 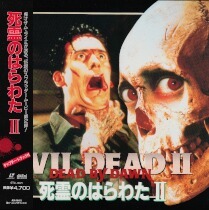 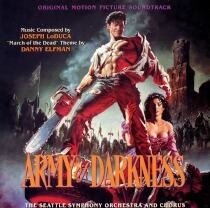 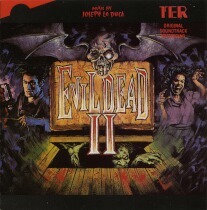 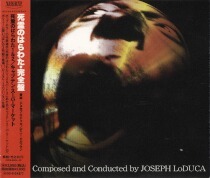 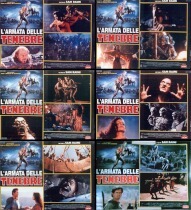 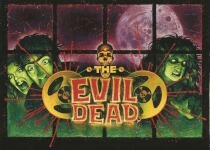 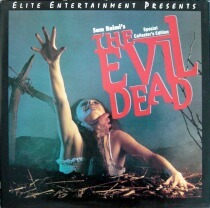 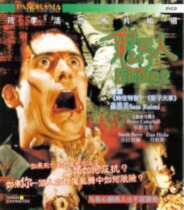 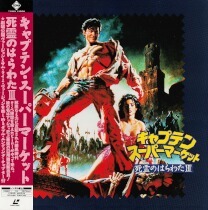 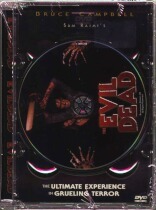 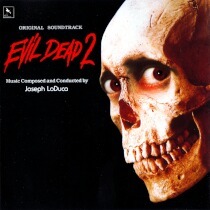 This section lists the various offical OSTs (Original Sound Track) or scores available for the Evil Dead trilogy, some of which only cover one movie while others are compilations. 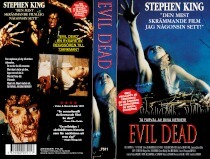 They listed alphabetically by country of release. 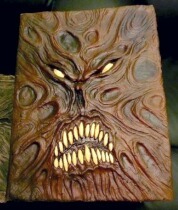 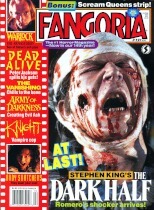 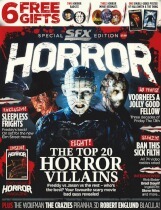 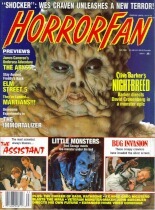 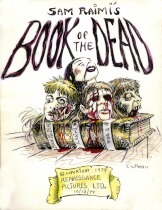 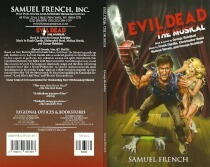 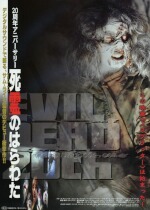 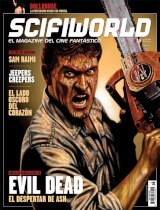 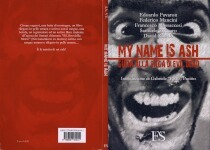 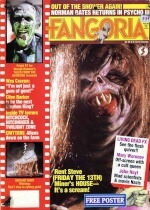 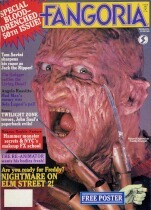 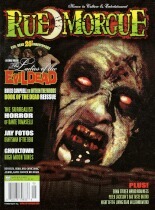 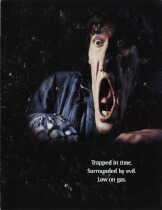 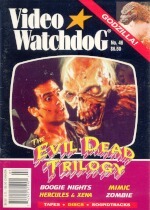 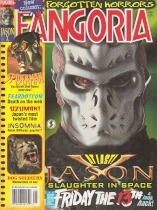 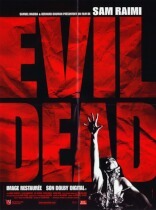 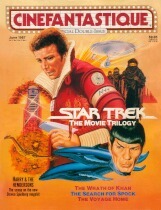 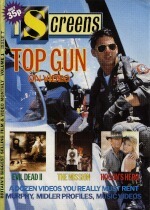 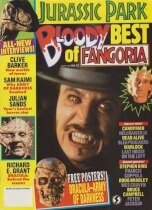 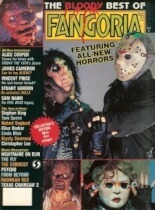 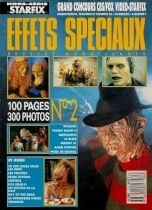 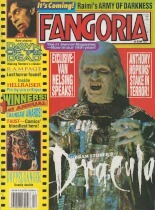 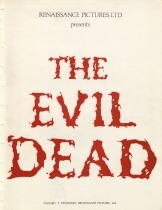 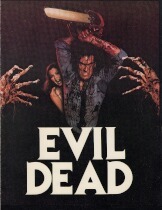 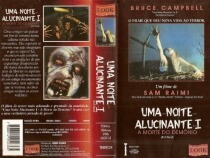 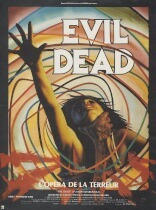 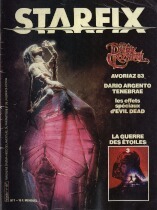 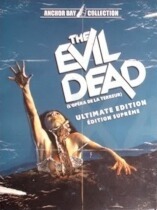 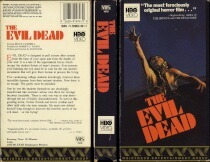 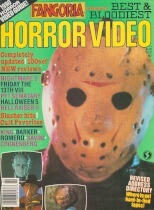 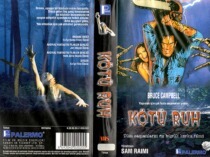 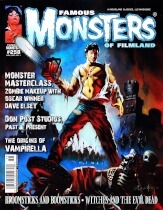 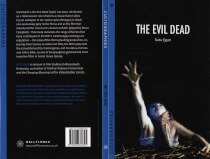 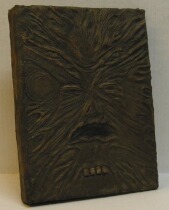 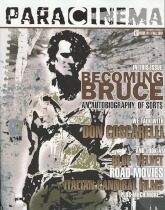 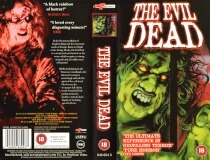 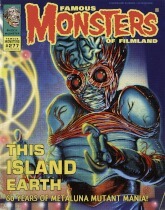 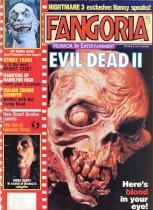 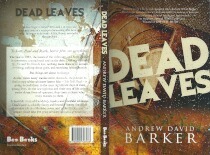 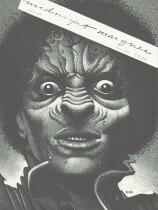 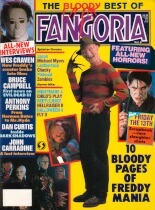 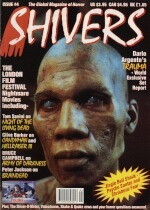 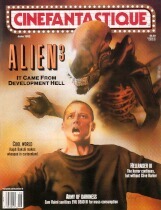 This section lists books covering either or both the subjects of the Evil Dead trilogy or the Super-8 shorts, some written by the people involved and others by independent authors. 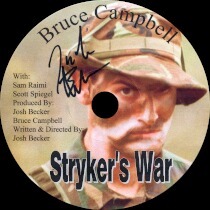 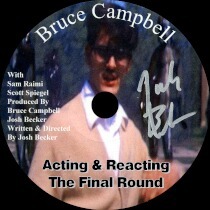 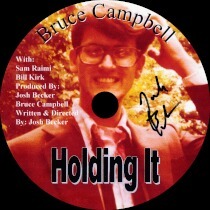 It's worth adding that both Bruce Campbell and Josh Becker have written other books, but they are not covered here as they don't touch on either of these subjects. 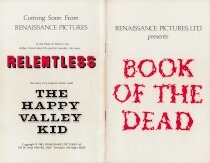 The titles are listed in order of release, with the oldest first. 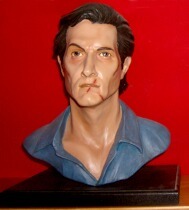 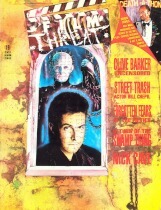 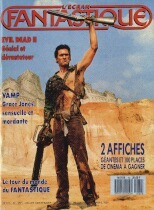 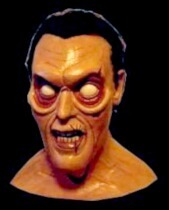 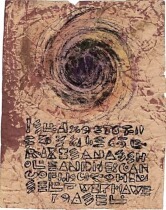 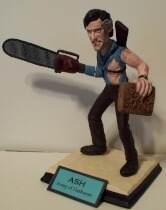 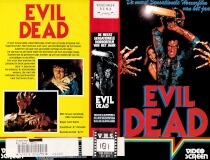 This section lists the many comics which take place in the world of the Evil Dead trilogy, or use Ash as one as their characters. 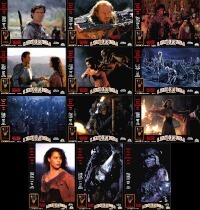 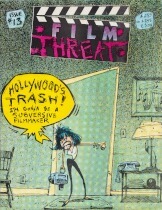 Some are direct adaptations of one or other of the movies, while others are completely independent works in their own right. 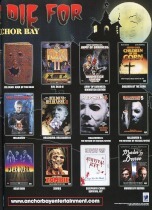 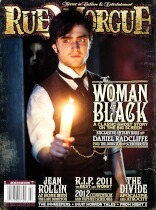 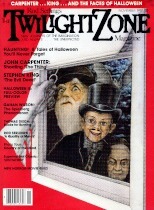 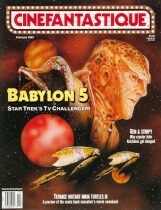 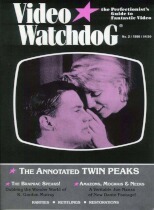 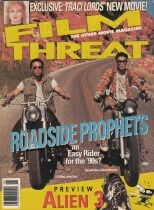 They're listed in order of each series' first issue publication date with the oldest first. 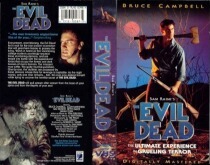 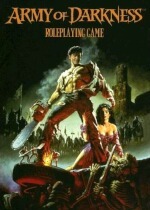 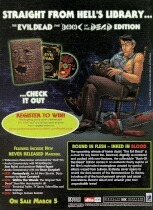 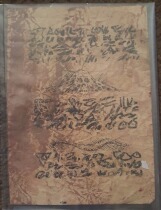 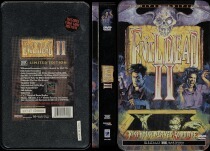 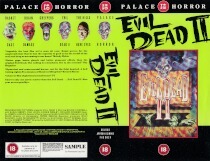 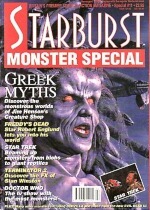 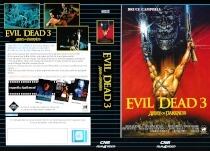 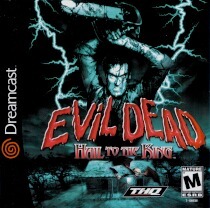 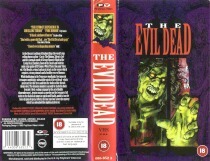 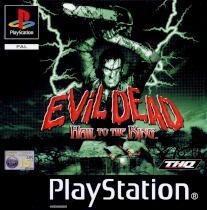 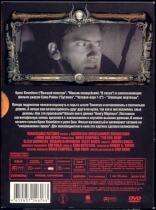 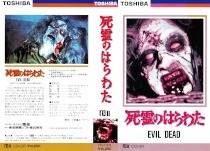 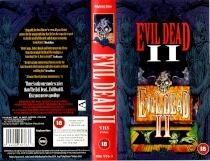 This section covers the computer games which take place in the world of the Evil Dead trilogy, on any platform. 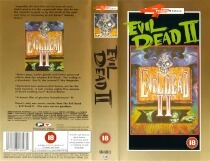 Only one of each identical PAL and NTSC game is listed . 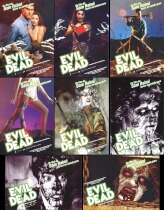 Each of the titles are listed in order of release date, with the oldest first. 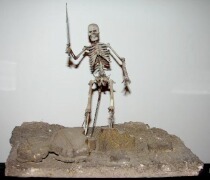 This section covers anything that could be considered a 'toy', although some of them may be more marketed at adult collectors rather than children. 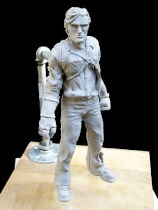 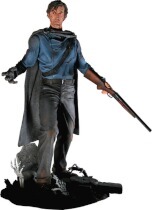 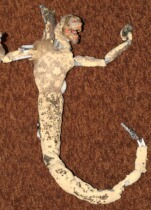 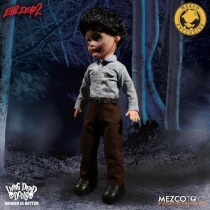 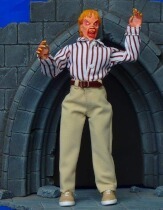 This includes mass produced collectable poseable figurines and the like, as well as one off fanmade custom items. 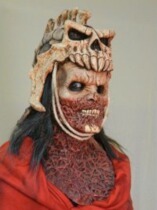 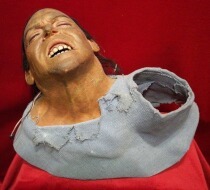 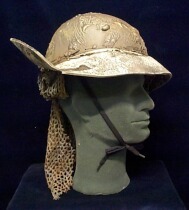 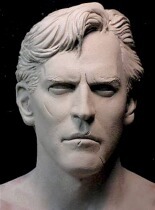 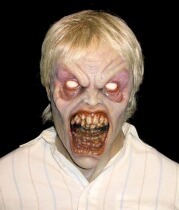 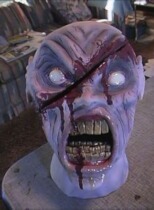 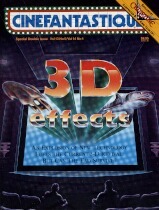 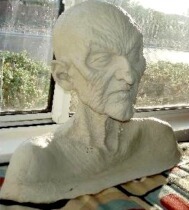 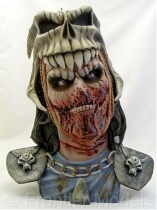 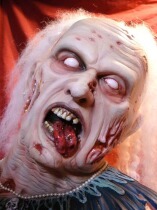 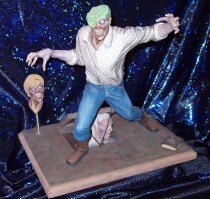 This section covers sculpted pieces; solid cast busts, wearable latex masks, and statues & model kits. 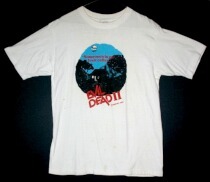 They range from mass produced officially sanctioned retail merchandise, down to one-off or limited reproduction fan made pieces sold on Ebay and other such sites. 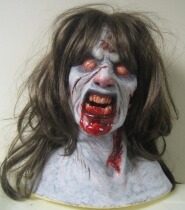 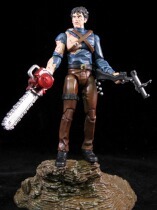 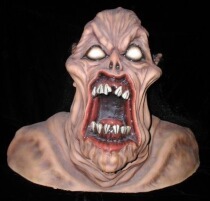 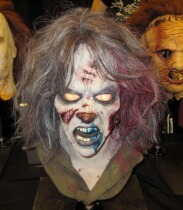 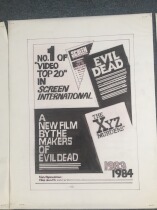 This section covers any genuine original items made for, or used in, The Evil Dead, Evil Dead II, Army Of Darkness or anything else suitably related, which have come up for public sale to collectors. 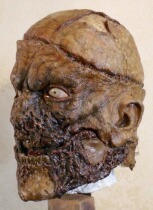 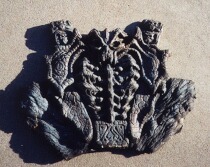 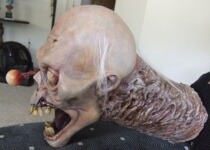 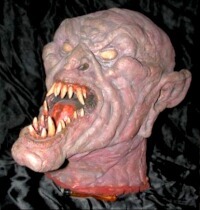 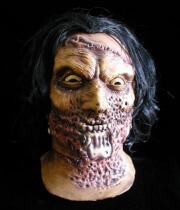 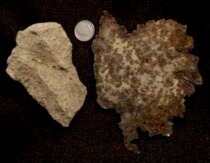 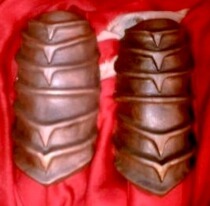 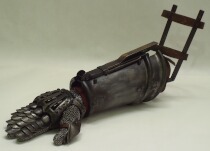 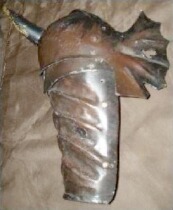 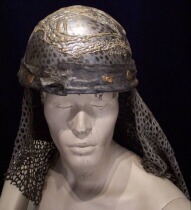 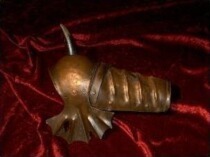 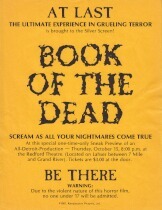 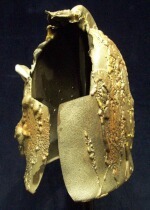 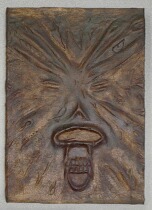 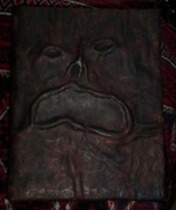 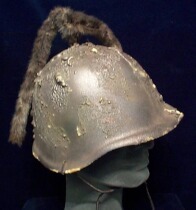 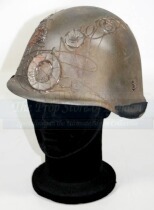 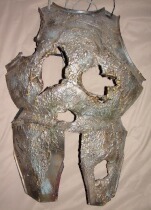 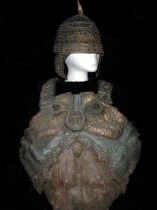 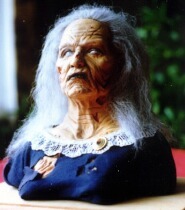 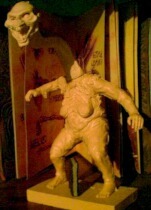 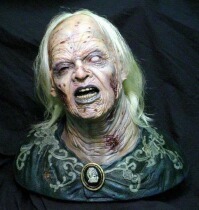 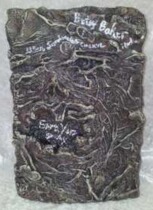 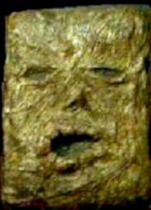 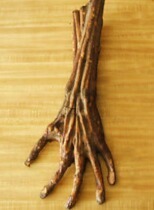 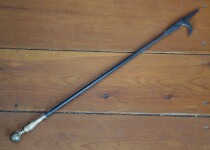 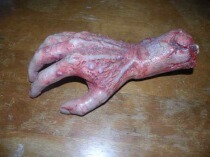 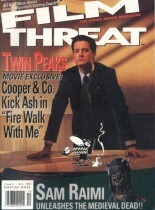 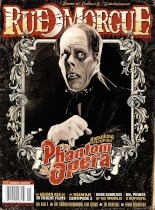 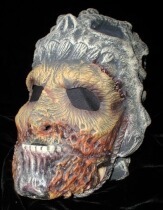 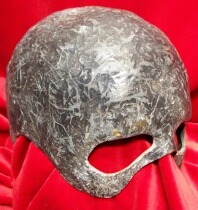 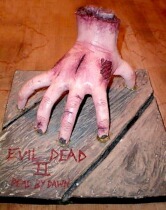 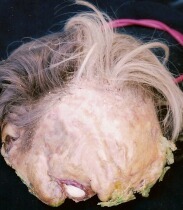 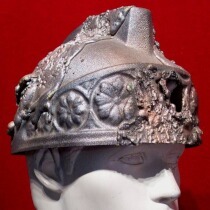 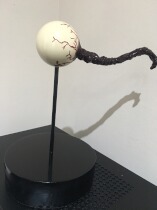 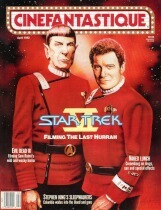 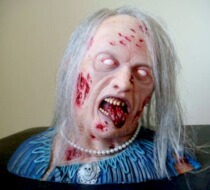 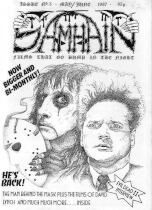 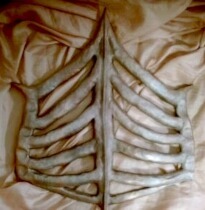 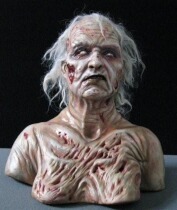 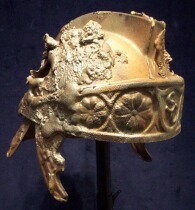 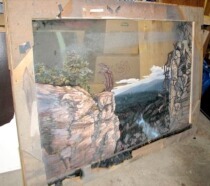 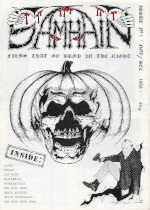 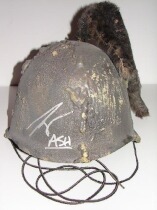 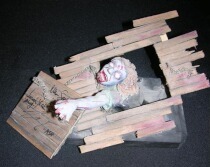 Also covered are one-off or limited reproduction fan made replicas of screen-shown props produced either for themselves or to be sold on Ebay and other such sites. 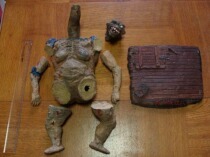 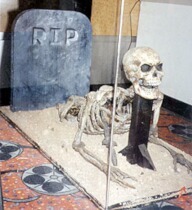 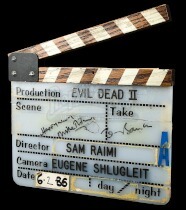 Evil Dead II props are quite rare, and items from The Evil Dead are extremely rare indeed, as most of the cabin's furniture & dressing was destroyed after shooting was completed leaving only a select number of props. 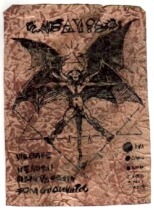 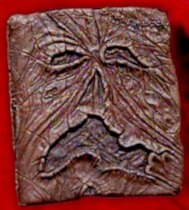 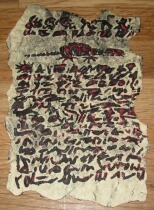 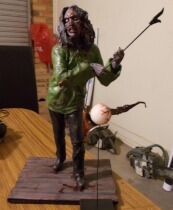 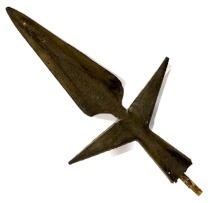 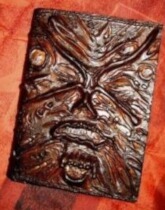 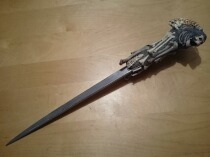 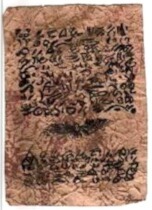 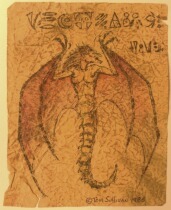 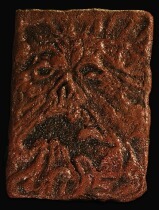 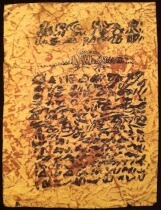 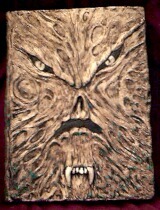 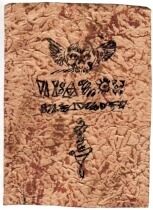 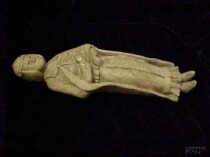 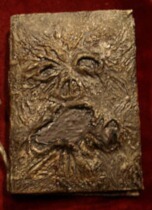 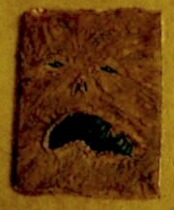 The original Kandarian Dagger no longer exists as it was recycled into the dagger seen in the sequel, which can now be seen along with both Books of the Dead, the magnifying glass necklace, and various other Evil Dead related items in Tom Sullivans's travelling Evil Dead museum. 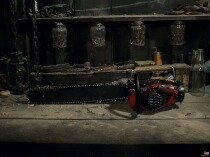 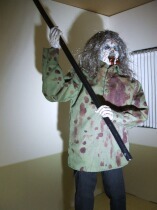 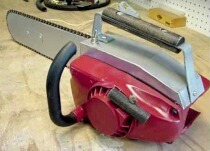 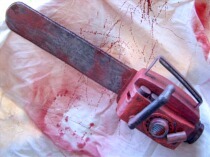 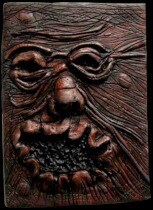 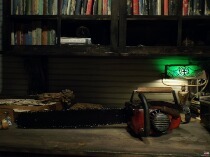 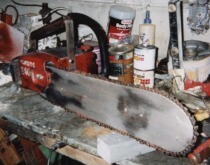 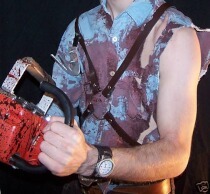 The only other The Evil Dead items known to have survived are the cabin clock which is likely held by Sam, and the shotgun which Bruce has stated that now resides with his brother Don Campbell. 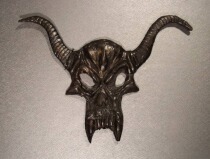 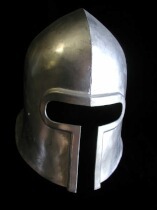 It's worth warning that Tom Sullivan fiercely protects the copyright to his creations, and has taken legal action against a number of individuals publicly selling replicas in the past, even with single/one-off items. 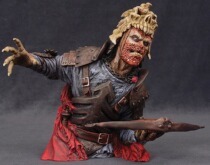 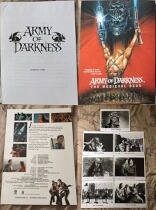 Screen used wardrobe/costuming/dressing items from Army Of Darkness are really quite widespread and not particularly rare at all. 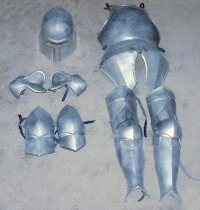 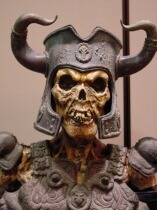 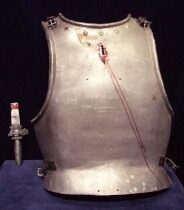 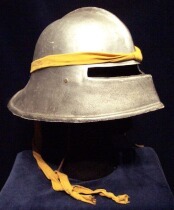 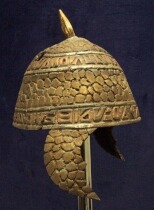 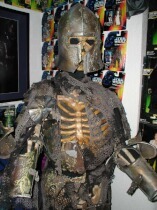 A Plethora of armour, weapons and costumes were sold by the boatload after the production wrapped. 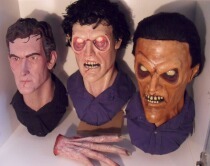 They still come up on Ebay and prop websites regularly and aren't that expensive to buy. 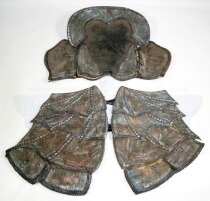 The items listed below are just an edited selection of what has been sold to private collectors over the years, a complete list would simply be and endless list and not feasable to index here. 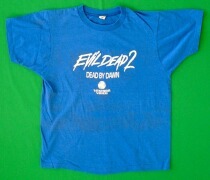 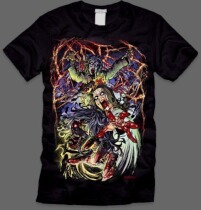 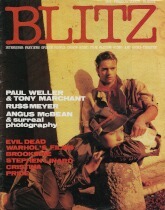 This section contains clothing related to the Evil Dead trilogy. 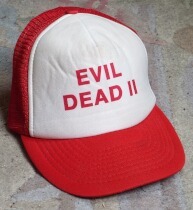 While there is a long list of unofficial and fan made clothing available, We've restricted this section only to official items such as cast & crew production items, promotional items, and officially sanctioned merchandise. 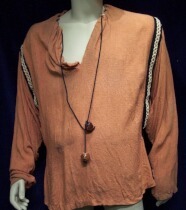 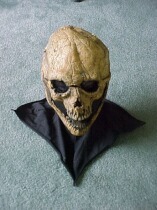 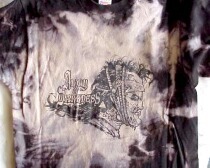 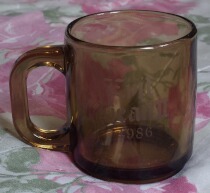 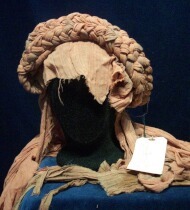 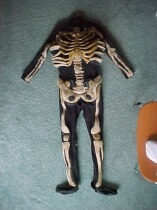 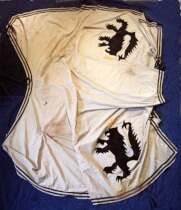 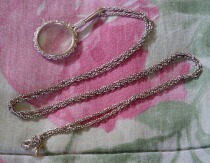 A wide range of unofficial clothing can be found on Ebay and other such sites. 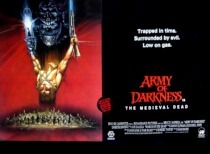 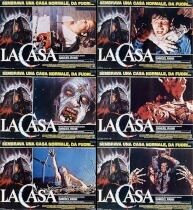 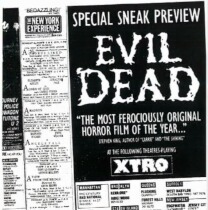 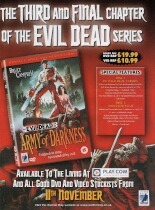 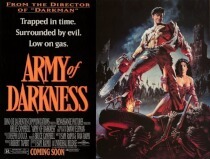 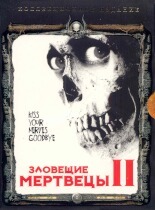 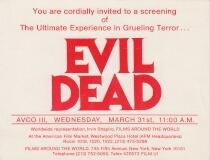 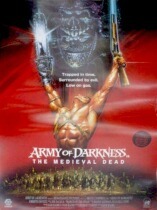 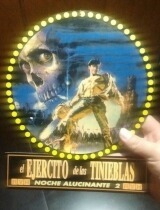 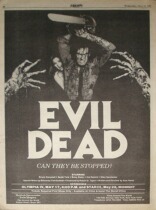 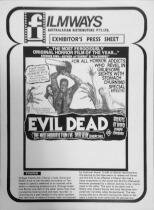 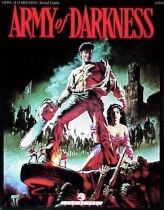 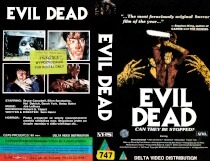 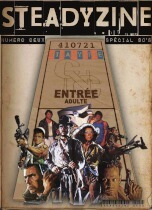 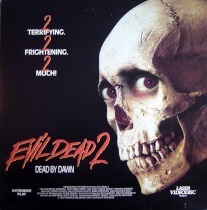 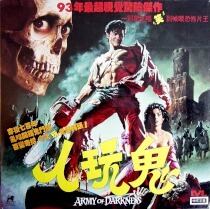 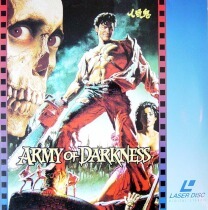 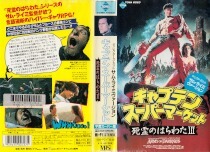 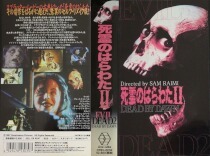 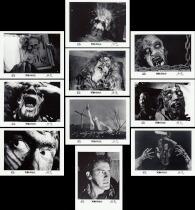 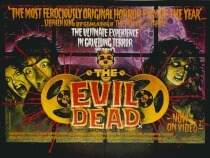 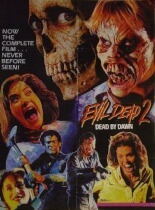 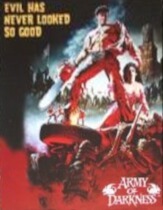 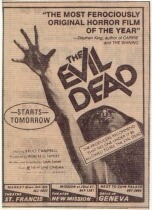 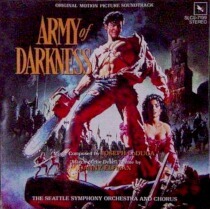 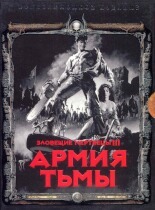 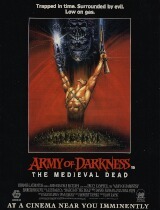 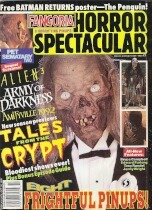 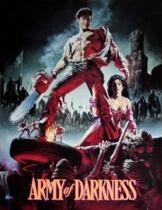 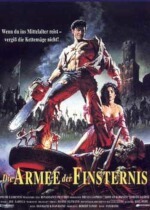 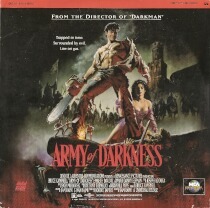 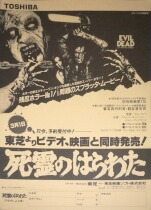 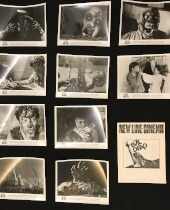 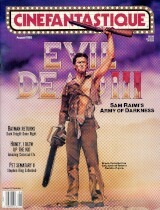 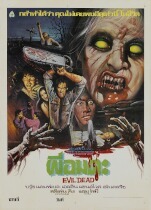 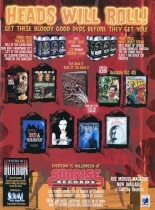 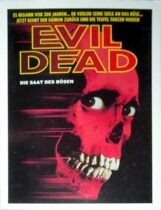 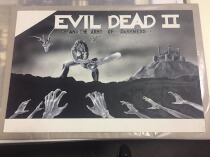 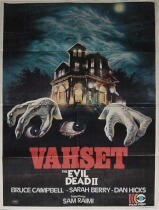 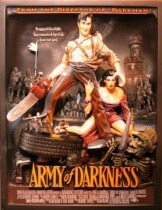 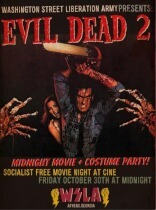 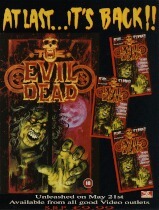 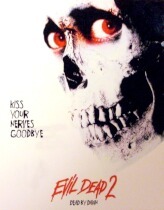 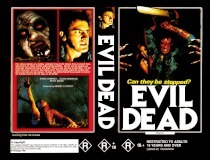 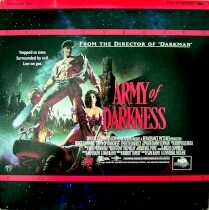 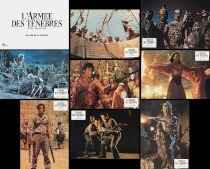 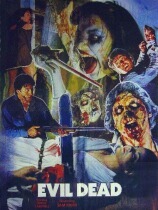 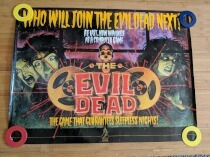 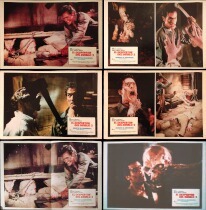 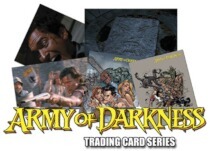 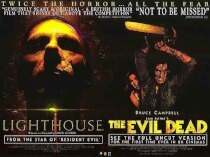 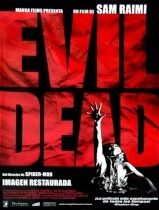 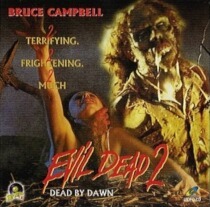 This section covers posters and other such promotional adverts & artwork for The Evil Dead, Evil Dead II, and Army Of Darkness from around the world. 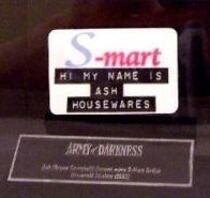 Items are listed alphabetically by country of origin. 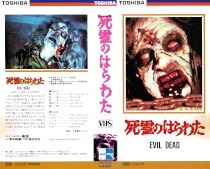 One interesting point worth explaining is that Chirashi are a type of highly collectable promotional movie flyers, quite specific to Japan. 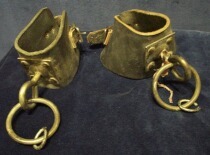 You can read more about these on Wikipedia. 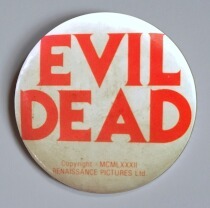 In this section you'll find the odd & disparate Evil Dead trilogy related items which don't belong in any of the thirteen other general categories above.